By default, only the billing account contact for the account can contact our support team and authorize changes. By doing this, we can keep your account secure. However, it is possible to give trusted individuals the ability to contact support and authorize changes to your account. 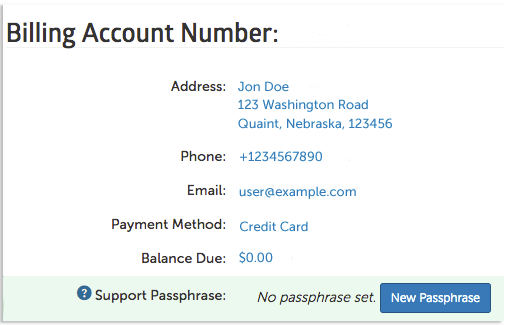 In the billing interface, hosting accounts can generate a support passphrase. This passphrase can be given to someone who is not the billing account contact and will verify to the support team that they have been authorized to contact support and make changes. This passphrase will need to be given to the support team along with any question or request. If the correct passphrase is not given, the support team will not assist the individual. A passphrase is not required for the billing account contact to request support. 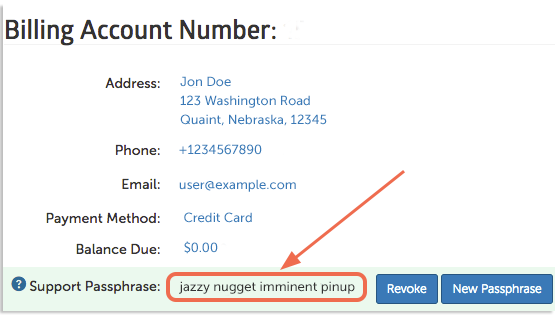 Passphrases can be revoked, which removes all outside access besides the billing account contact. New passphrases can also be generated, replacing the old one. Old passphrases are not valid and will not be accepted by the support team. They will only accept the current passphrase on the account. The new passphrase will now be next to Support Passphrase. Give this passphrase to those who you trust to contact support and authorize changes to your account. You can remove their permission at any time by revoking or generating a new passphrase.